The next time you are on the beaches of Costa Rica and are astounded by the fashion sense of a group of surfers in their light and dark blue matching rash guards, you might be surprised to know it's a pack of Costa Rica Outward Bound surf students. That's right - we have our very own rash guards now! Each top was remarkably handcrafted by the American company, Wholesale Rash Guards. If you didn't notice the tropical chic of these beach dwellers, it might have been because you were too focused on their brand new surfboards. Costa Rica Outward Bound recently purchased ten new surfboards not only to maintain the quality for our surf students, but to accommodate different surfers. This means that, in addition to our standard sizes for learners (ranging from 6'8" to 7'2"), we now have six 6'4" fishes and four longboards (three 9'6" and one 10'2"). We were so excited about the rash guards that we had a silly little photo shoot with two of our staff members: Surf Instructor, Alex Cook, and our new Enrollment Administrator, Maggie Foote. Nope, it's not the most realistic setting for surfboards and rash guards, however this rainforest base is located only two hours from our beach base in Manuel Antonio where we just recently added strong new fans, new window screens and a new stove top! The rash guards will be used in our Manuel Antonio base for students who are passing through it for 1-3 days of surf instruction. So, surf students, get ready for a fun, brand NEW, exciting experience this summer! We certainly are. To watch a video about how to purchase your own rash guard before coming on one of our Packing List: Rash Guards video given by Surf Instructor, Alex Cook. University of Alabama returned to us for the second time this school year (see this newsletter article about the service project they completed last December); this time, with Alabama Action Abroad. This group of honors student spent a semester studying global poverty and service, and ended their course with a service trip to Costa Rica with Outward Bound. Sign up to get the newest edition of the Canopy Chronicle which contains an article about their service project in Talamanca. Most students' friends and family get different images in mind when reading the update, "Students are in Panama this week..."
While most envision the Panama Canal (which is actually about 12 hours away by bus) and/or the commercialism that it brings, they would be surprised to learn about the beauty of both the scenery and the culture in Solarte (pictured right) where Costa Rica Outward Bound students stay. Just 20 miles south of the Costa Rican border lies the Archipelago of Bocas del Toro, Panama, a cluster of six principal islands that forms a province on the Caribbean Sea. It is famous for its luscious palm forests spreading over the islands, an extensive coral reef system that is a snorkeler's playground, and beautiful clear water full of tropical fish. 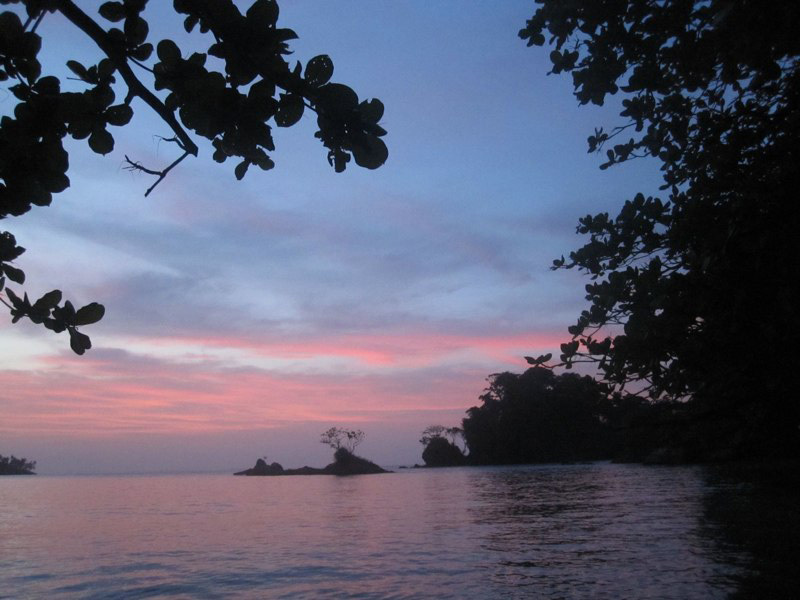 One of these islands, Isla Solarte, is the destination for all Costa Rica Outward Bound courses that involve a SCUBA portion, including all semester courses (Water & Wave, Tri-Country, and Leadership) summer courses. The Archipelago of Bocas del Toro was originally discovered in 1502 by Christopher Columbus and became an often-visited spot by pirates during the 17th century. On their underwater dives or in their rainforest hikes, many Costa Rica Outward Bound students hope to find buried treasure that is rumored to still be hidden in the area. Solarte's defining geographical feature is Hospital Point, so named after the hospital built there in the 1900s by the United Fruit company to quarantine yellow fever and malaria patients. The hospital was abandoned in the 1920s when the United Fruit company shut down operations on Solarte due to a plague that knocked out most of the banana plants. Much of the snorkeling done by Costa Rica Outward Bound students takes place around this point. Students arrive on Solarte via water taxis (taxis marinos) and are immediately greeted with a view of palm trees, greenery, and clear water. Houses nearby are made from boards of wood, often with thatched roofs. 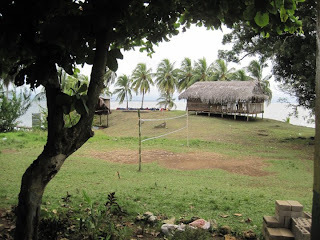 Solarte also has a simple structure which serves as the community's church and a small school right behind the rancho where Costa Rica Outward Bound students stay. The nearby field serves as a soccer field, and in between scuba dives students have ample opportunity to join in futbol, especially in the evening. During the day, the temperature is very warm, and when it is windy it can get very windy. In order to escape the sun's intense rays, students turn to Duckies, inflatable kayaks that provide a wonderful way to get a closer look at the crystal clear Caribbean waters. Every year we explore new places to go with students, new outdoor activities, and new service projects. 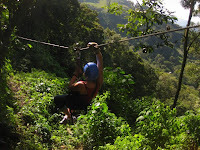 And because of our last Panamanian reconnaissance mission, we have recently added a plethora of courses and activities in Panama including: Panamanian Kayaking Adventure, Volcano Exploration and Panama Adventure, Outward Bound USA's sea kayaking phase of their semester course, and our Girl Scouts Underwater Explorers course. Article donated by former Communications Director, Kathleen Sullivan. When we partnered with Outward Bound USA this year to create a semester course that was partially in the Florida Keys and two-thirds in Costa Rica, we had no idea what an unforgettable - and unique - experience it would be for both the students and the instructors. Among them were yours truly, Orlando Zamora and Danny Jimenez, who said nothing else but, "¡Increible!" upon their return. The photos below tell it all. 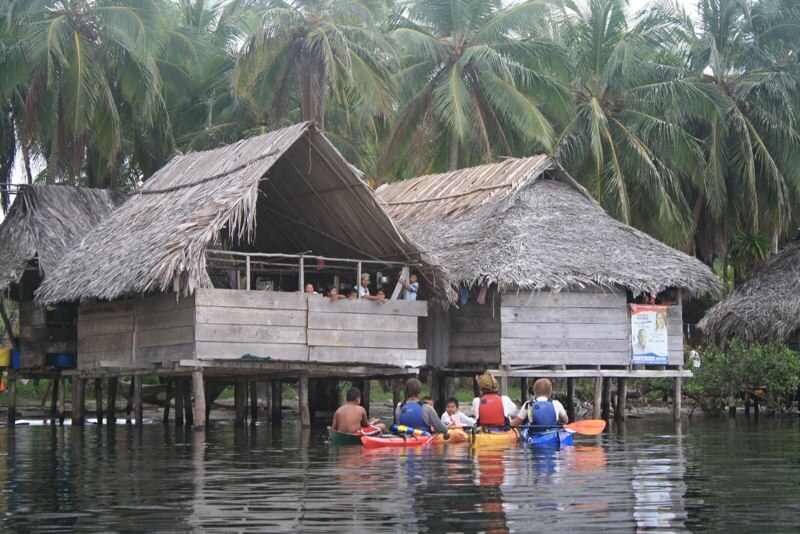 During Panama Phase (for the sea kayaking adventure portion promised to them in their semester itineraries), they embarked on an adventure far more exciting and adventurous than most students could ever expect on course. 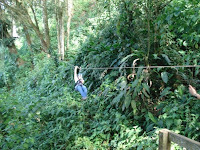 The reason being that few of our students are able to explore uncharted territory with the instructors. 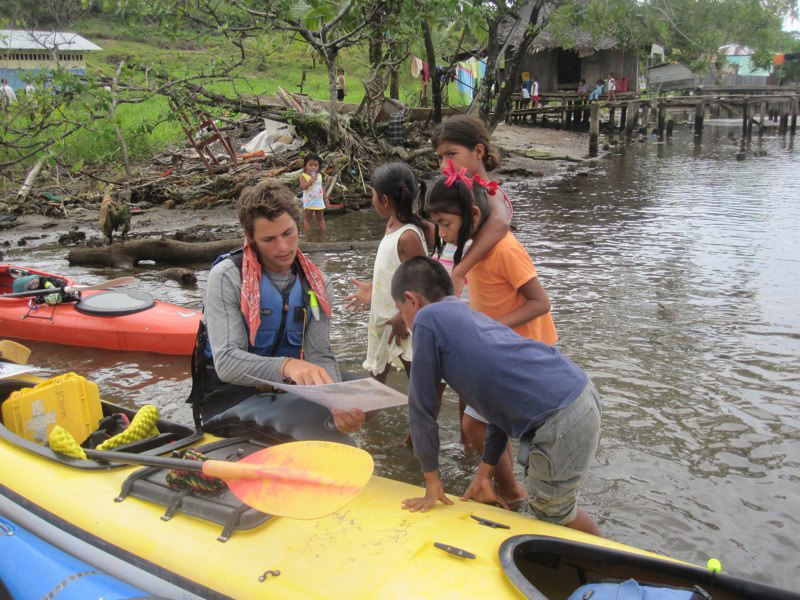 And as a result, they found new islands, new activities, and most memorably, new people. Most of the natives from the islands had never seen outsiders before seeing this group of students. We were amazed by the result, and for this we highlighted our favorites in this blog. Link to the official web site for their course where we acquired these photos. 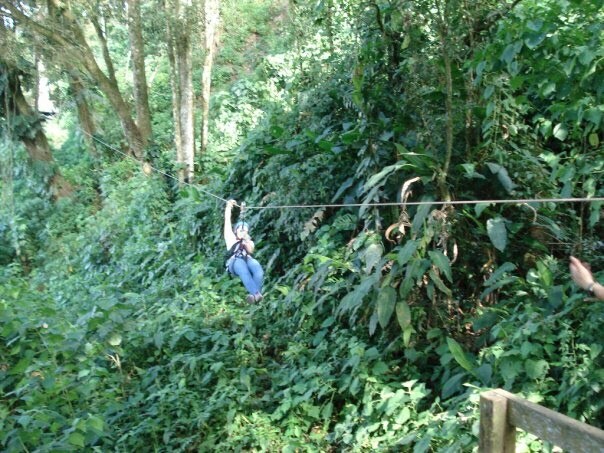 Discovery Kids' 2001 series of "Outward Bound" took place on one of our very own Costa Rica Outward Bound Multi-Element courses when nine students came to challenge themselves. Well, that, and to become famous. Zorro, Fuego, Luna, Sol, Estrella, Ave, Chancho, Tiger, and Sloth (as they all nicknamed themselves) spent seven days here, rafting the Río Pacuare, visiting Orlando's homestay, doing solos, and learning a lot about themselves. Some of their instructors included Kevin (White Water Tech), Jim (White Water Tech, our Executive Director), and Cesar (River Instructor). Watch some of the 15 episodes below. It was another great course with Canyon School (aside from all of their flight complications, of course). After more than three years of coming to Costa Rica with its tiny eighth grade classes (usually 8-10 students! ), Canyon School Elementary was back again for a course meant to mentally and emotionally prepare its students for heading to high school this fall. Their 7-day leadership and maturity development course was a fun-filled week of zip-lining, waterfall rappelling, hiking, homestays, a one-hour solo, rafting, camping, surfing, and getting to know a little more about one another before this spring's graduation. "a fun, challenging course that develops leadership skills, keeps everyone on their toes, and brings people closer together." "It had a big impact on the students," Alex Cook (one of their two primary instructors) remarked. "I really want to see how they're doing five years from now." 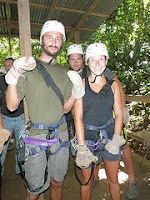 Read more about their instructors, Alex and Mauren, here. Photos to come! For most students coming on a course that includes surfing, they become quite perplexed after reading the item "rash guards" on their packing lists. We're here to help you put that confusion to rest. Rash guards help protect your skin from surfboard rashes (caused by popping up on a surfboard over and over) and strong sun. Lifetime surfer Alex Cook - one of our Surf Instructors - describes in the packing list video below how he searches for his rash guards . This information will prepare you to make an informed decision as to a) if you should purchase one or not, and b) how to purchase one if you do decide to buy one. Picture yourself: Over 20 hours of running, swimming, treading, saving, strengthening, studying, and more swimming... all in four days. The upside? It all takes place on beautiful beaches (and our rainforest swimming pool) of Manuel Antonio, and you have the chance to receive an Open Water Lifesaving certification. 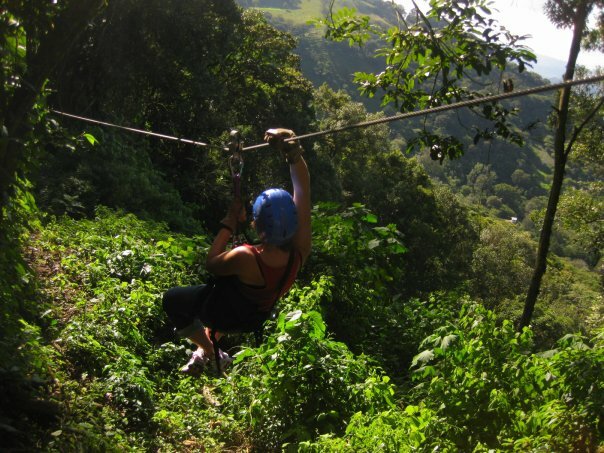 Okay, so it's not the idea that most people get in their heads when thinking about a trip to Costa Rica, but it is for Leadership students. While they do come here to introduce themselves to a new culture and language, they also have some serious goals in mind to become Outdoor Leaders. With those goals comes a lot of hard work and responsibility in order to acquire all seven certifications offered on a Leadership Semester course, including the Open Water Lifesaving Certification. This is similar to lifeguarding training, but it includes natural bodies of water (not rivers, however - read about the Whitewater Rescue Technician certification here). You'll be happy to know, too, that this is the same training our instructors get before becoming an instructor. Open Water Lifesaving is a tough certification to receive, and not all students pass it. It requires four tough days (split into two separate weekends) of hard physical work in a pool, on a beach, in calm open water, and in rough open water. 90% of their time is spent in the water. The final day consists of both the written and practical exams. For the practical exam, Carlos uses his analysis of trainees to push them to their own individual limits during the final physical evaluation. This includes a rigorous combination of running, swimming, and treading for long periods of time, during which he orally quizzes them on open water lifesaving knowledge they have been studying. Carlos is more than experienced training students to become certified lifesavers. He has trained with four major organizations: the American Red Cross, YMCA, United States Lifesaving Association (USLA), and Marine Rescue. 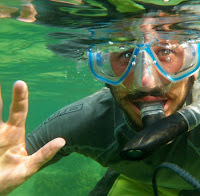 After so many years of experience in training and testing, Carlos is happy to report "there have been no serioius incidents," and "Even if they don't all receive the official certifications, all trainees at least have enough knowledge and practice to save a life in an emergency water victim situation." University of Alabama's students arrive on Monday, and they have a big service job in Talamanca ahead of them. And who better to lead them than our veteran Tico Land Instructor, Orlando Zamora, along with one of our newest instructors, Sean Marr? Our Custom Course Manager, Shawn Pendergrass, will also accompany this group of eleven honors students and their chaperone, Wahnee Sherman. Shawn has been working hard to plan this service project ever since he went to Talamanca on a reconnaissance trip last January. He found three areas needing assistance: Waste Management, Youth and Community Development, and Environmental Awareness. 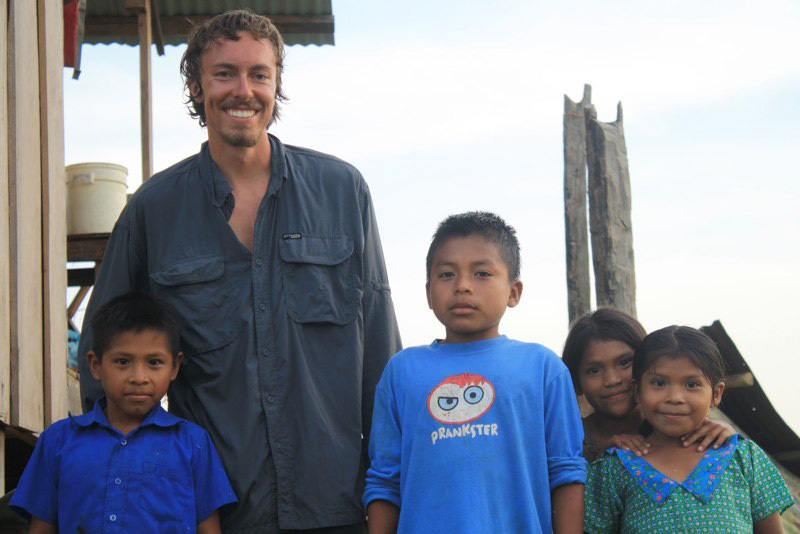 The group of 15 will head to the town of Amübri in Talamanca where villagers are establishing a youth group in the community and involving them in community service projects. Waste management improvements will include: building trash/recycling bins, giving presentations about proper waste disposal, picking up trash, and designing PSAs for the town to run on the local radio. Community Development will include: developing team-building and leadership-building among the youth and greater community, improve the recreational facilities, preparing English lessons, and planning a field day for the community. Finally, the Environmental Awareness work will include: reforesting areas, creating a nursery for endangered trees native to the area, and constructing signs with environmental messages. 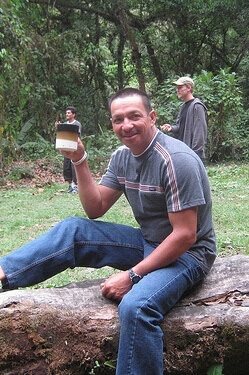 About: Orlando is arguably the strongest instructor we have at Costa Rica Outward Bound (and possibly in the entire country). He not only built his house for his wife and five kids, but he carried their cast iron stove 15 km to his house on mountainous rainforest terrain. And last December on a different University of Alabama course, he carried the large cistern (water tank) 12 km to the small village during their water supply service project. About: One of Sean's most unique characteristics is his ability to do flips, due to the gymnastics training he had growing up. 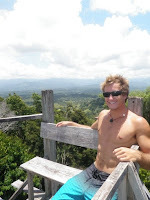 As an adult, Sean has been busy with a lot of worldly experiences including studying in Mexico and teaching ESL (to students from all over the world) back in Pennsylvania. But don't let all of this traveling fool you - he is very close to his family and hopes to move back there some day. It's important, too, to understand the background of this village in order to understand the importance of these projects. For one, the population of Amübri has increased exponentially (to approximately 2,000) in recent years and, with it, consumerism. The increased consumption of products is causing environmental problems because of the lack of waste disposal options. 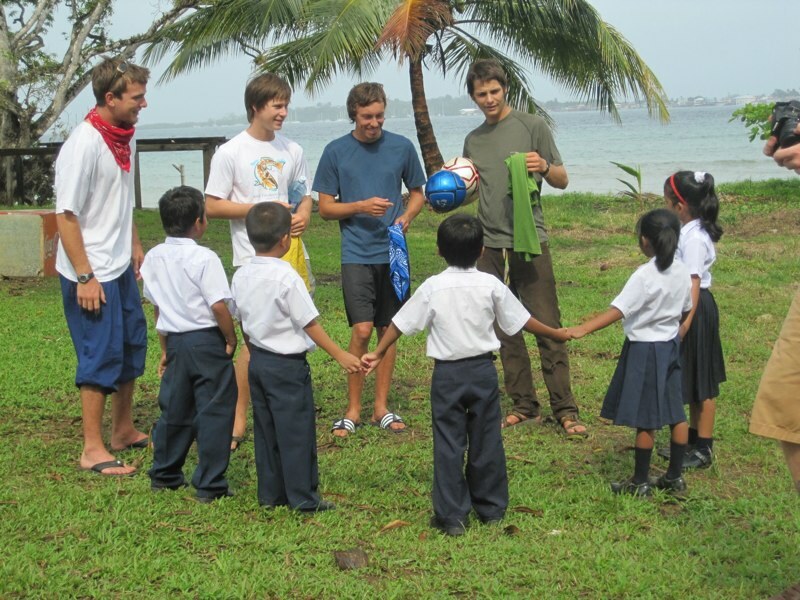 Secondly, since the community has grown, Peace Corps Volunteers recently formed the community youth group, Koswak. They will be transitioning out this month. Basically, this is all perfect timing for University of Alabama to come in and make a difference. 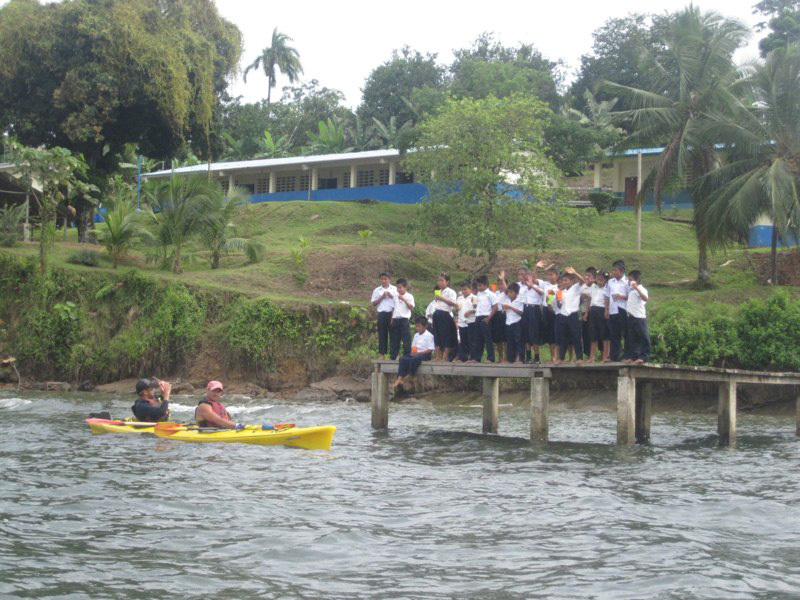 On June 2, 2010, Costa Rica Outward Bound released an article to the media about all of the work they accomplished. We published it in our newsletter, The Canopy Chronicle for our followers to read. The Canyon School students are most likely packing their bags right now, unable to sleep tonight out of excitement. They might be going on last-minute errands to purchase some food or supplies they want to have with them while hiking through the rainforest. These nine students (and Brendan, their chaperone) will be happy to know their instructors, Mauren and Alex, are currently doing the same thing down here to prepare for their arrival this Saturday. Before introducing the instructors, we want to introduce this unique school nestled in a Californian canyon. Its mission is to "foster lifelong love of learning and individual academic growth and achievement." It prides itself on "providing a sanctuary for developing the talents, strengths, and confidence of each individual so that students become resourceful adults who think and act creatively and critically in the world community." 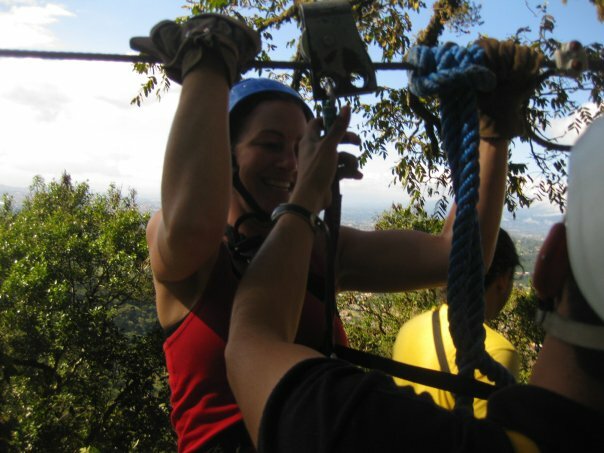 About: Mauren is one of our toughest female instructors. She is known as "Mau" by her friends, and she got married last year to another adventure guide. One of her surprising passions includes watching free-style motocross. When she's not instructing courses, she enjoys playing soccer with people in her town. Most of you have alumni done this hike into the remote village of Piedras Blancas. You remember it, right? The one up into the upper canopies where you camped, then down to Orlando's homestay, then the Lopez's homestay (where you inevitably milked a cow or squeezed some sugar cane), then up to Rancho Tinamu singing with Santiago, then down closer to the beach to surf in Manuel Antonio? Yep, that's the one. If you were wondering how far you went or how high, we finally compiled a summary of this trek across southern Costa Rica. So there you have it. When you tell your family and friends that you did, in fact, do some real hiking in the depths of the rainforest, you can show them these maps to prove it. If they still do not believe you, at least you have the experience - and the large thighs - to remind you of what you accomplished. They come in May with the rain. At times they can drive you insane. and this happens over and over again. Meet: the Abejones de Mayo. People in the States call them "June bugs." 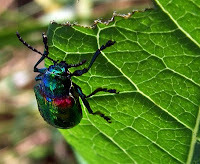 Ancient Egyptians believed scarab beetles to be sacred. Their colors range from brown to metallic gold. They are common in tropical locations. Costa Rica is home to 70 different species of abejones de mayo. They come out once a year, and when they do, they are everywhere. They land on our desks at work, hit our bedroom windows, and even run into our heads (probably because they are dizzy after just running into a wall). "Those laid in May will reach their biggest size in around November to December, when they will undergo a transformation into adulthood that takes around a month. It is then that they stay in a state of immobility until the first rains fall, usually about three months later," says Helen Thompson of A.M. Costa Rica. Their life cycle lasts about one year. It begins in the soil and ends with a thud. It's hard to believe that a Costa Rica Outward Bound course is the first time some students have ever cleaned, cooked, or led a group. Students who come on course have at least one role per day, and these are rotated to different students each day. In some cases, with smaller groups, a student can take on more than one role. In taking these roles, students improve their leadership skills, personal development, and course comradery. And in addition, it follows the Outward Bound mission and philosophy. Responsibility: This is the group leader. A cacique is responsible for motivating the other students, leading them, and encouraging responsibility in his/her fellow students' roles. Responsibility: This is the journal writer. A hanashita is responsible for writing the daily journal entry and reading it at the nightly meeting**. Responsibility: This is the carrier of the medicine bag. A xiamen must always remember to keep the medicine bag with the group all day. Responsibility: This is the chef. A cocinero is not always responsible for cutting and cooking everything, but he/she organizes the meal and gives jobs to others to help prepare the meal. Responsibility: This is the "bus boy." A trapo is responsible for cleaning the food area after a meal. He/She does not clean all of the dishes, however. On course, it is the responsibility of each student to do their own dishes. Responsibility: This is the Spanish teacher. The profesor/a teaches a Spanish lesson to the group at the nightly meeting**. Responsibility: This is the announcer of the daily quote. An awa finds a quote in the hanashita book or rehashes one of his/her favorite quotes to the group in the chow circle*. Responsibility: This is the water "dictator." The agua mono must be sure that all of his/her fellow coursemates are drinking enough water all day, and he/she keeps the iodine handy for water that needs filtering. Responsibility: This is the trainer. The entrenador leads the other students each morning to stretches that help with the activity that day. For example, on a Surf Phase, the entrenador will probably lead his/her group in some yoga balance moves. Responsibility: This is the teller of jokes. The comedian can tells jokes all day to keep spirits high, or he/she might just save one joke for the nightly meeting**. Responsibility: This is the nature teacher. The naturalista is responsible for remembering one thing he/she learned about nature during the course, then teaching it to the other students at the nightly meeting**. Watch Costa Rica Outward Bound students display their role playing on course in this 2001 episode of Discovery Kids.